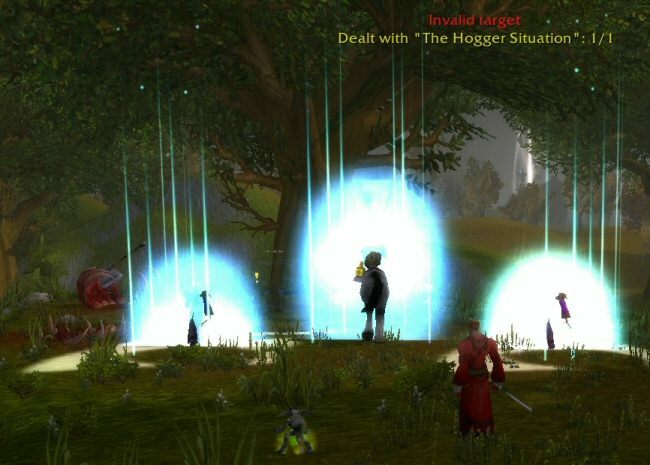 Shamus Plays: WoW #12: Hogger! Just before things turn bad, a bunch of guys teleport in. 3. 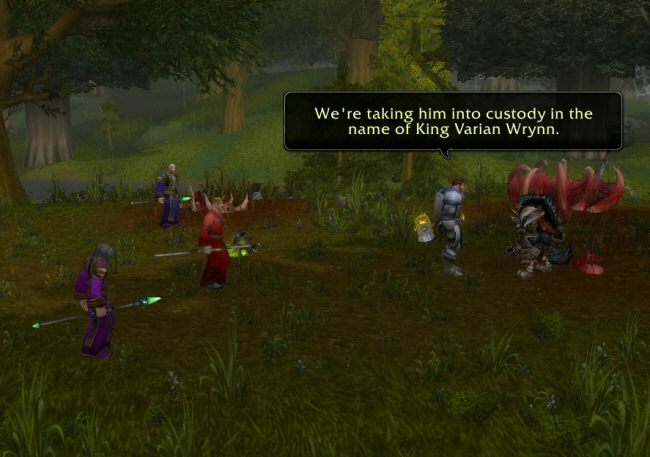 The in-world "scenes", where a bunch of NPC's stand around and emote and type to each other. These are a nice try at making the world immersive, although they don't really work for me. The text bubbles hang around long after you're done reading them, which takes an epic moment and makes it stiff and poorly paced. And the bubbles tend to overlap. And it's not always clear where you should be looking. It's like being the cameraman when you don't know the script. Some high-ranking general has come, along with a couple of mages. Also, a couple of kids came along, so they could cheer him on. "You brought your underage fans into battle with you?!?" Norman shouts to the guy. The General ignores him, and captures Hogger. "You're arresting a GNOLL?!?!" Norman shouts. He is red-faced with rage. "Yesterday the job board had me killing a human for ... something. Don't worry what it was for. The point is, he was probably a bad guy but nowhere near as bad as this demon-gnoll you're trying to arrest. What the hell is wrong with you?" 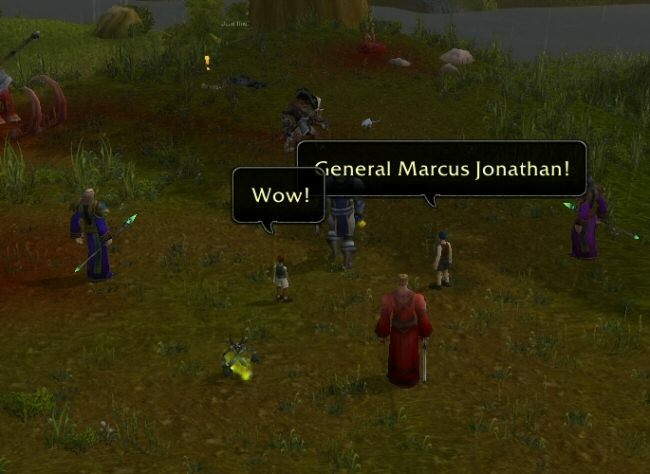 The general, his prisoner, his mage backup dancers, and his adoring fanboys all teleport away, leaving us alone in Hogger's camp. "What the hell just happened?" Norman asks. "Looks like the General came in and ninja'd your kill, boss." "We'll see about this!" he says with fury. 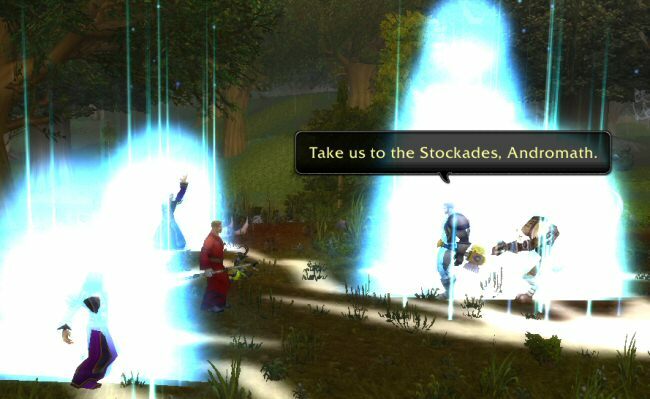 And then he marches us back to Goldshire. He elbows his way through the crowd, shouting at the idiots that get in our way, "Move it, freak. No thanks, I don't duel people that drool on themselves. Put some clothes on, you degenerate."